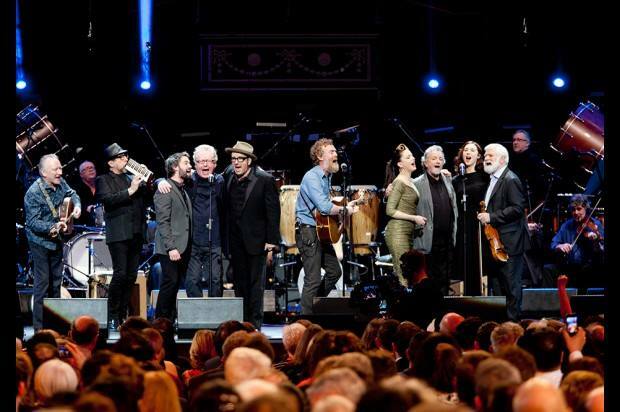 Glen performs with many other Irish poets and musician as part of Ceiliúradh (Celebration) in honor of President Michael D Higgins’ historical first State visit to London. Notes (by Fleur): The Ceiliúradh at the Royal Albert Hall has been organised to mark the first-ever state visit to England of Irish President Higgins and his wife Sabina. The visit follows on from the state visit undertaken to Ireland by Big Liz (aka Her Majesty The Queen) almost three years ago. I’m not going to get into the lengthy and involved history between the English and the Irish (although the same is worthy of a read if you have some time) but suffice to say it has been turbulent. This, at times, fractious relationship between two very near neighbours has significantly improved of late and tonight’s proceedings are billed as a celebration of the culture that entwines both nationalities. The Royal Albert Hall is a magnificent venue – built by royalty it has hosted some incredible events and it is rammed to the rafters to night with Irish nationals, English-based Irish and their descendants. Being none of the aforementioned I am somewhat out of place – but I have certainly learnt by now that a night of Irish poetry, dancing and music is enough to raise the spirits of any mortal – whatever your nationality. The Irish are proud and they love their President. This is evident from the standing ovation afforded to Michael D for simply entering the room at the start of the proceedings. I think it is only right and proper that a bastion of culture such as Ireland has a poet as their head of state. There is a mixed bag of entertainment from the stage – music, spoken word and dancing. I am particularly moved by Joseph O’Connor and Olivia O’Leary who both speak profoundly about their experiences with the English. There are some fantastic musical performances from a multitude of different artists (including an amazing ‘house band’ filled with eminent Irish musicians) – I am, however, very pleased to report that the undisputed highlight of the night is brought to the crowd by none other than our ginger-bearded troubadour. Glen (with the assistance of the fabulous Lisa Hannigan on vocals, Thomas Bartlett on piano and John Sheahan from The Dubliners on violin) provides a lovely stripped-back ‘Falling Slowly’. He then invites all the musical performers for the night on stage for what can only be described as a joyous version of the Brendan Behan prison tune ‘The Auld Triangle’. Everyone takes a verse – including John Sheahan – and by the end of the song, Glen has all 5000 people in the building (including Michael D and Prince & Princess Michael of Kent) on their feet belting out the chorus and jingle-jangling. It’s spine tinglingly good – the honour and pride in the room is palpable – and I am not even Irish!!! The night is also rounded off a little while later by an all-in version (including choir) of ‘The Parting Glass’ – again led by Glen. It’s the end of a rousing night and one that Tourism Ireland can be very pleased about as a showcase of Irish culture. I have to say – it’s a pretty darn good night’s entertainment for £7 (no I am not joking – that’s how much the ticket was!!). There is some fantastic footage of the night available via RTE and Myles O’Reilly so if you want to see how the Irish ‘do it Royal style’ then I certainly recommend that you check it out.